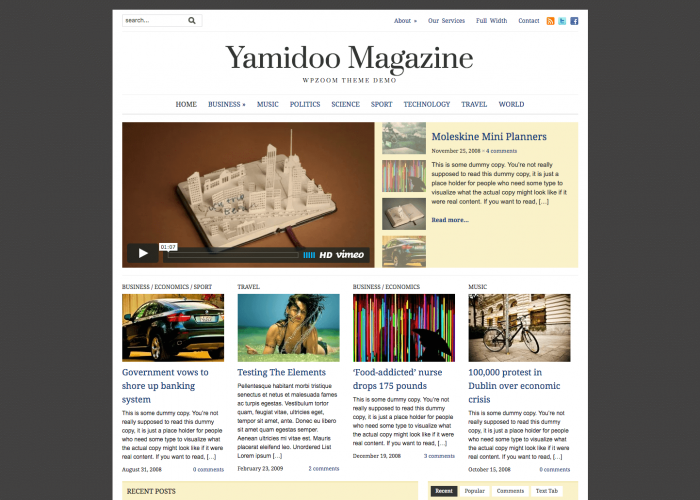 This magazine-style theme is a knockout for any type of informative website even a complex News Portal. 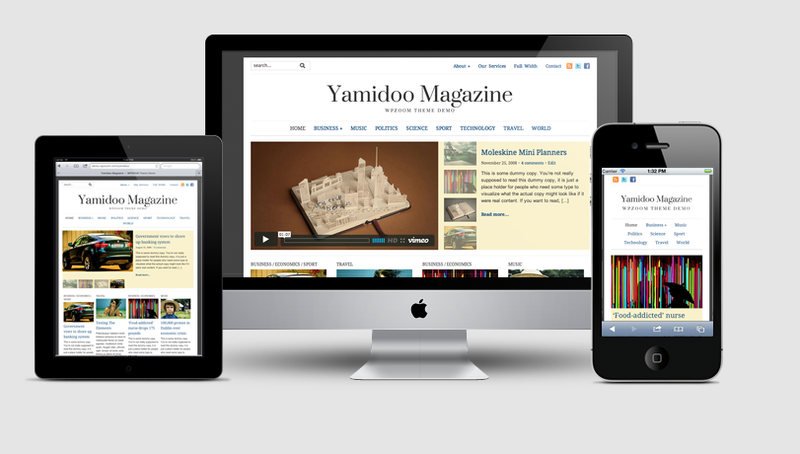 With its simple layout, Yamidoo Magazine can be easily styled to create the perfect look for your blog. Get access to all our 43 WordPress Themes for just $99. Plus you'll get new themes delivered free - as well as our excellent support! NEW Automatic Theme Updates are Now Available in All Themes! Theme Options PanelWith our advanced Theme Options Panel, you can easily customize every detail of your theme to best suit your needs. 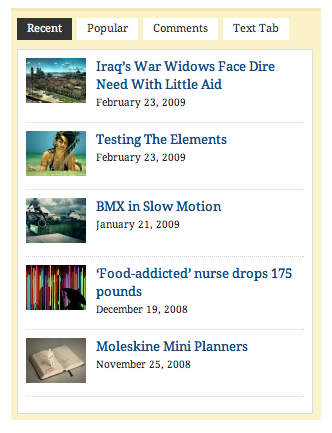 Video IntegrationAdd videos to the featured content slider – which play straight from your site. 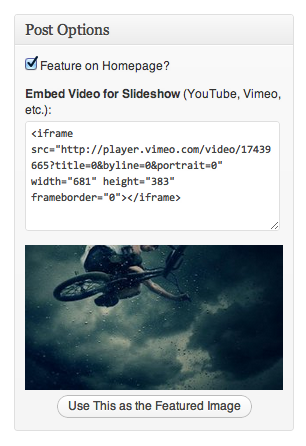 Featured SliderShowcase your featured posts using the easily configurable homepage video and image slider. Tabbed WidgetUse this dynamic widget to transform any widgets into tabs! Responsive LayoutThe layout of this theme automatically adapts to fit on any screen resolution on desktop and mobile devices (iPhone, iPad). Custom WidgetsMake use of the custom sidebar widgets, including: Flickr Gallery, Popular Posts. Trusted by 50,000 Happy Customers! Post-purchase support is 100% friendly and professional. 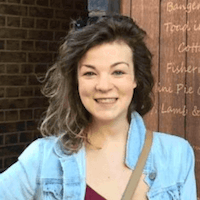 By far the best and professional bunch of WordPress themes I've ever encountered! You'll have your new theme up and running in no time thanks to our quick and easy installation process. Each theme is well documented with all the information you need. You can replicate the structure and look of our themes demo pages with one click, by loading the dummy content and widgets. All our themes are compatible with the new WordPress 5.0 block editor called Gutenberg. We've tested extensively all of our themes with Gutenberg so you can be ready for WordPress 5.0. Change colors and fonts straight from the Customizer. Upload your own logo with the press of a button! All our themes are localized and multi-language ready, meaning they can be easily translated into any language. We've got tutorials to help you, too. Our themes are coded by our team of professional developers who use the latest web standards to ensure clean, readable and easy-to-modify code. Each of our themes comes with an intuitive and easy-to-use theme options panel that allows you to configure and customize your site without ever looking at code. Our framework constantly evolves in order to accommodate all new themes. When an update is available, you can automatically update it with one click. All our themes have lifetime usage. You may cancel or upgrade your subscription at any time. Support and updates valid for one year, then renew at a reduced rate. 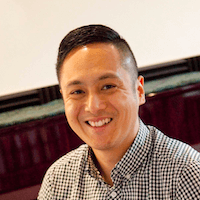 Licensing FAQ. Do you provide Dummy Content from your demos? 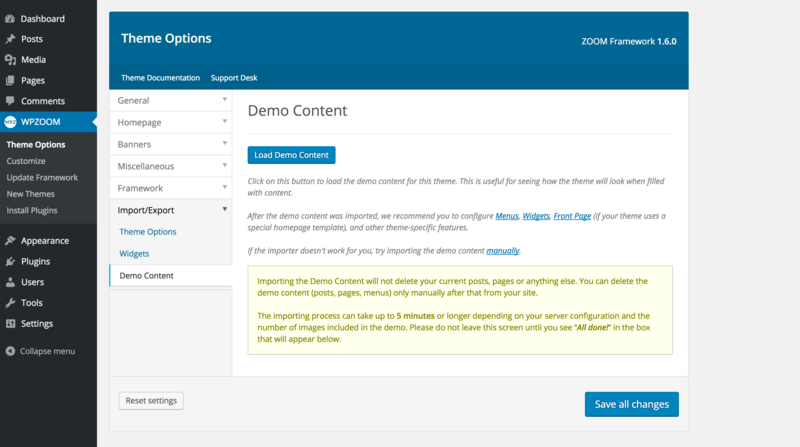 Yes, our themes include 1-Click Demo Content Importer which allows you to setup the theme quickly as in the demo. View Details. Can I use a theme on more than one site? A Single Site License grants you the rights to use the theme on two websites owned by you: one development (staging area) website and one live website. If you want to use it on more websites, you will need to upgrade your subscription. What is your Recommended WordPress Hosting? SiteGround is our recommended WordPress Hosting provider, as it offers great plans and quality for all types of budgets. Can I use your themes on WordPress.com site? Yes, but you need a Business Plan subscription. We recommend you going with a regular WordPress hosting like SiteGround instead, as you're not required to have a WordPress.com account to use WordPress and our themes and it will cost you much less. In this tutorial you can see how you can migrate from WordPress.com to self-hosted WordPress. Can I upgrade my theme to the All Themes Package? Yes, if you have purchased a theme from us within the last 30 days, you can upgrade by paying the difference between your current product and the one you want. For more details contact us directly. Can I translate your themes? Yes! All of our themes are localized (internationalized), and this allows you to translate easy your theme in any language. Can I modify/customize a theme? Yes, you are free to change anything you want in the theme. Your theme download package contains all the CSS and WordPress template files, therefore the customization possibilities are endless. You don't need to credit or link us back. 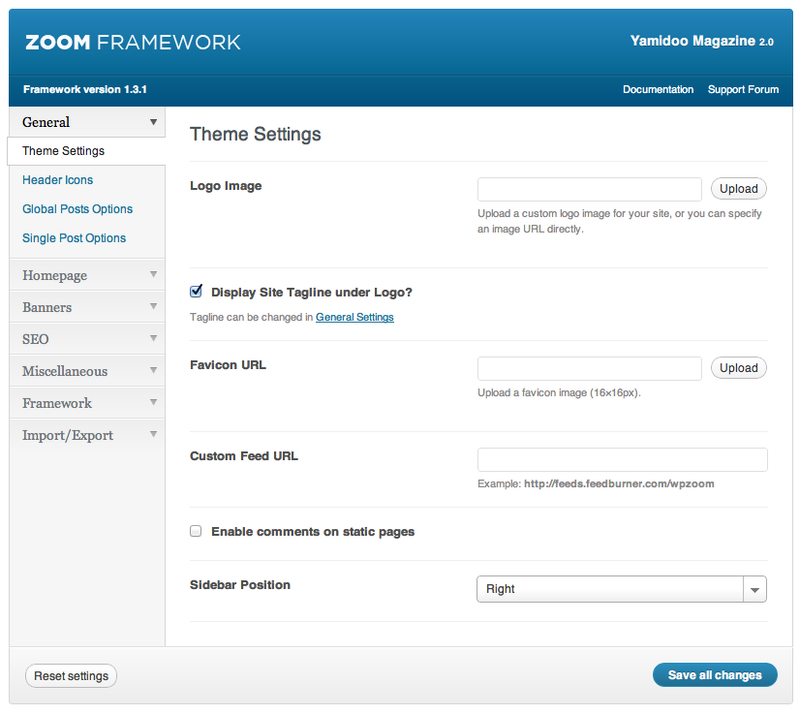 Will your themes run on latest the WordPress version? 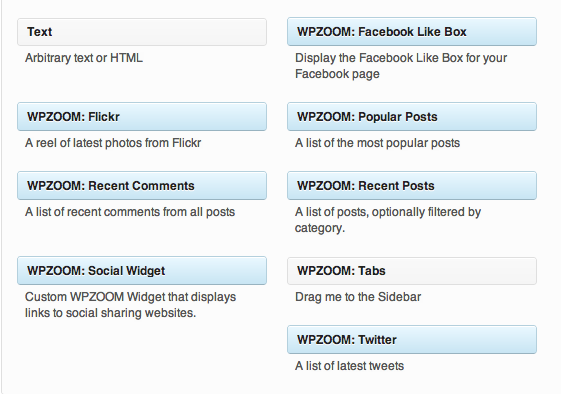 Yes, all of our themes are compatible with the latest version of WordPress. How often are your themes updated? Each time a new version of WordPress is released, we check our themes for compatibility with the new version, and we update them if this is required. 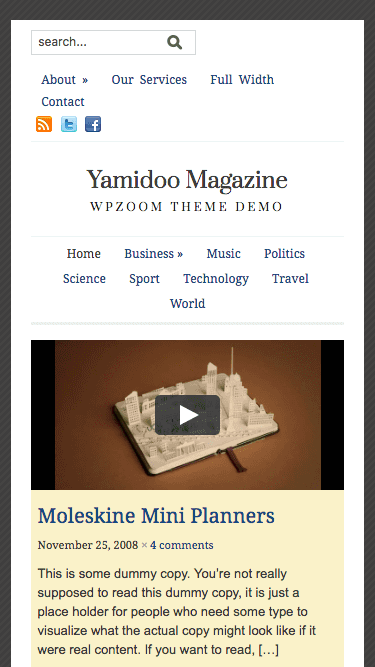 Also we update our themes any time we discover a bug or a new feature has been added to the theme. Can I use your themes on a Network (Multisite) install? Yes, our themes are compatible with multi-site installations. Your theme will continue to work after your license expires. You are free to continue using the theme for as long as you like, but you will need to renew the license in order to receive support and updates. How much does it cost to renew my license? Individual Theme licenses and All Themes Package can be renewed after 12 months at a reduced rate. You will be sent an email when it is time to renew the license. Can't decide which theme is right for you? Let our experts find the best theme for your needs!